Does showing funding progress and having deadlines actually speed up fundraising? I noticed a trend on sites like Kickstarter or Wikipedia where users are asked to donate towards some cause. There's usually a progress bar shown and a deadline after which the fundraising is going to be done. Is there any research that shows whether this speeds up such campagins? And if it does, what is the reason behind it? Are there any projects that were successfully backed 100% before? Was your product launched successfully? Is your product/cause a solution to an existing problem? Does your product/ cause have a community support who would like it to become reality? Does the community have enough people to back your project close enough to the goal you have in mind? Pebble is not a newborn startup that needs a Kickstarter campaign. It makes enough revenue to approach the international market and sell their product worldwide. How Kickstarter helps is by implementing Gamification that shows real-time updates and money they've collected to showcase their success with transparency amongst the pledgers. First up, this is very similar to a Preorder. You get a discount, you get special "Kickstarter" mark on the product you backed for a cheaper price than it would sell in retail a few months later. Another key aspect in play is Trust. Pebble is one of the most popular products on Kickstarter. Three of the four biggest sums raised on Kickstarter is from Pebble. This automatically brings in the customers who backed the earlier product of Pebble and then brings new customers who can ensure that this project will succeed. 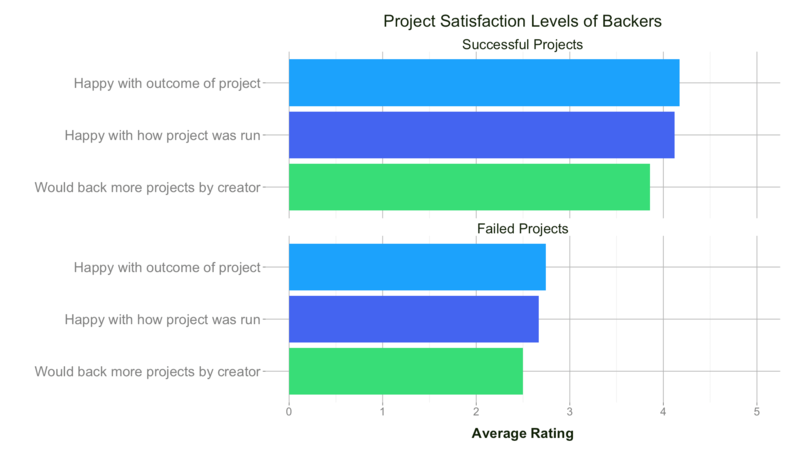 As per the chart below, most of the people happy with the run of the project would back more projects. But what about new projects? As per the Fulfillment of Kickstarter, Projects that raise less than $1,000 fail the most often, so a new project mostly will need to growth hack its way to reaching the initial $1000 and then simply market more to get more people backing its project. The crucial play in Psychology is the goal. Once the goal is close to being met, users are almost sure to pledge the product since they will get it at a discount, it will meet it's goal and they will likely support a cause. Without a goal, it looks just like another Developer/Designer's page who asks users to donate or buy them coffee. Sure, people will but not as much as you'd show them a goal. People prefer to back a project when it has 100%+ of its funding goal reached. Apart from that, the product is also what matters. People will only back your product if it's something creative and a solution to a problem. Regardless of the platform you use, if people do not think your product is a solution to a problem or think it's not creative enough, Gamification won't help it meet the goal any sooner. A deadline helps a project that's already backed 100%+ or close enough to being backed 100%. If it's already backed and the deadline is today, a user wouldn't mind spending a little money to get a special edition product for a discount. If it's not backed 100% and the deadline is a couple days from now, users who are passionate about the project will share it across and back it to make sure it meets the deadline. Similarly to the Wikipedia cause. The cause is what matters. If the same organisation has fulfilled a cause before, it adds to the trust and one will be pleased to back it again. The answer to your question, Yes, Goals and Deadlines do help projects and causes, however, the product/ cause determines the success of it. If one has already completed a previous project with success, the chances of a goal being successful this time, will be higher. How do I calibrate the gamification system in my webapp? Could gamification of training database work in a manufacturing environment?